Fettuccine Alfredo. It tells you a lot about Italian cooking. Because Italian cooking, at its core, often means a few simple ingredients coming together quickly for a flavorful, uncomplicated dish. Also, since there are just a few ingredients, and because it’s the Italian way, those items must be of good quality. Good fresh grated Parmesan. Fresh parsley. Garlic from the produce department in cloves, not minced in a jar. That’s the Italian way. Now I’m going to add a couple of America’s favorite elements to it. We’ll make it a one pot wonder, and we’ll lighten it up just a bit. I promise you’ll love the convenience and you won’t miss a bit of the cream! Yes, that’s right. I’ve made this Alfredo with milk instead of the traditional cream. I do add a smaller amount of cream than most Alfredo recipes call for, because it blends beautifully with the grated Parmesan at the very end. That’s the key to luscious and light but not globby Alfredo–add the cream and cheese at the very end, and then serve immediately! For this recipe I’ve replaced fettuccine with penne pasta and added some nice skillet-grilled skinless boneless chicken breast. Still cooked in one pot, but all of those drippings from the grilled chicken just add flavor and depth this delicious dish. How long before this meal’s on the table? 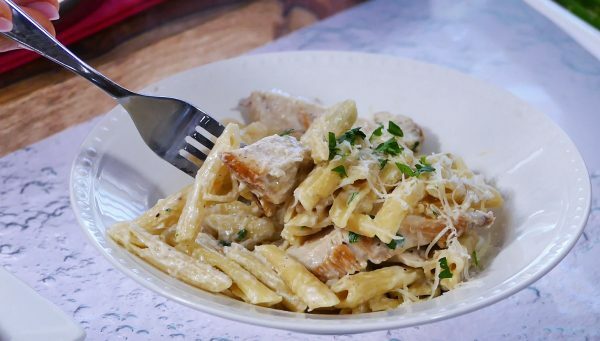 Only about 20 minutes from start to finish for a fantastic One Pot Chicken Alfredo! Check out my how to video here! Heat olive oil in large skillet. Add chicken breasts and cook until seared on both sides. (For tender, juicy chicken, cook all the way through but do not overcook). Let rest for 10 minutes and then slice into 3/4 inch strips. Set aside. Heat the same pan without cleaning. Add garlic and cook for about 1 minute, stirring the drippings and garlic around. Do not burn garlic. Add chicken broth, milk and raw pasta. Stir, then cover and cook on medium low for about 10 minutes or until fork tender. Gently stir occasionally so pasta doesn't stick to pan. Do not overcook pasta. When fork tender, add cream and Parmesan cheese. Stir gently to combine. Add chicken and stir gently. Add salt and pepper to taste. Top with parsley, stir and serve.